There’s no place like home, but when you’re ready to go on a short adventure just down the road from Lindsborg, all you need is a zest for fun and The Kansas Guidebook 2: for explorers in your hand. Coauthors Marci Penner and WenDee Rowe have traveled near and far to make your quest to find hidden gems in the Sunflower State a snap! Go. Explore. It’s time for Adventure Kansas. Then come back to home, sweet home: Little Sweden USA! Stan Herd Mural: 113 S. Main. 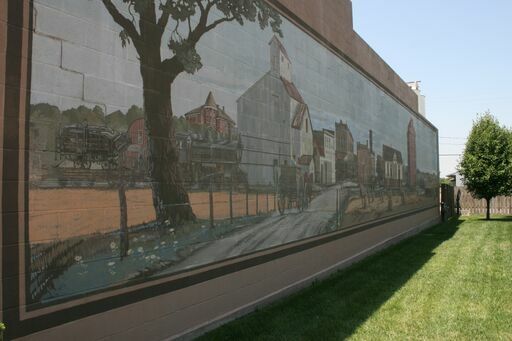 On a building wall south of the Prairie State Bank, a 1986 Stan Herd mural depicts Inman around 1910. Inman Museum: 101 Main. A continued work in progress, this museum has a lot of life! Inman in the late-1800s is presented in exhibits filled with artifacts from businesses, from the wheelwright to the mercantile, an 1887 Rock Island depot and a 1909 telephone office. Inman Harvest Cafe: 112 S. Main. Goulash for breakfast? It’s made with hash browns, onions, scrambled eggs, sausage, and cheddar cheese, and it’s a big seller! But so is the hot roast beef sandwich with beef slow cooked for 12 hours. Lake Inman: It’s the largest natural lake in the state—a half-mile-wide circular sinkhole. In the late 1860s when Major Henry Inman made the trek on the Fort Harker Trail from present Kanopolis to Wichita he camped at this body of water. This is a small preview of what you’ll find in The Kansas Guidebook 2 for this featured incorporated city of Kansas. The Guidebook is filled with many more Kansas communities and other hidden treasures. You can buy the book online at Kansas Sampler Foundation or at Hemslöjd, 201 N. Main Street, Lindsborg. We’ll feature other day trips from Lindsborg on a regular basis, so be sure to subscribe to our emails for updates from us! Marci Penner and her father, Mil Penner, traveled the state in the early 1990s and the result was three small Kansas guidebooks and the formation of the Kansas Sampler Foundation. The mission of the foundation is to preserve and sustain rural culture. Marci has served as director of the Inman-based non-profit since its inception. Some of the most well-known projects of the organization have been the 8 Wonders of Kansas, the Kansas Explorers Club, the Kansas Sampler Festival, the We Kan! Conference, the Big Rural Brainstorm, We Kan! Tidbits e-blast, the PowerUp Movement, and the Kansas Guidebook for Explorers. From 2012-2016 Marci and assistant director WenDee Rowe visited every one of the 626 incorporated cities in Kansas to research for their new Kansas Guidebook 2 for Explorers that debuted in May 2017. The research duo has been traveling the state again to do guidebook programs and motivate people to get out and explore. Marci graduated from the University of Kansas and received a Masters degree in Counseling and Guidance from the University of Wisconsin. She spent five years in the Philadelphia area as an elementary guidance counselor before returning to Kansas in 1990.